New MAX Efficiency Miter Saw Blades are engineered for faster cutting and more cuts per charge. When used with a cordless miter saw, MAX Efficiency miter saw blades provide up to 30% more cuts per charge compared to standard blades. 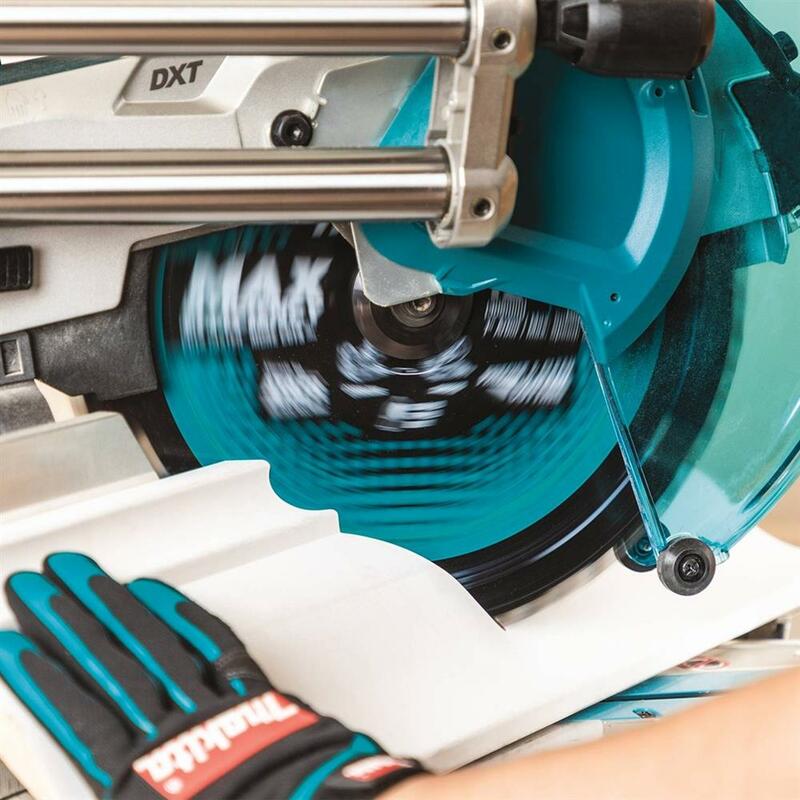 March 26, 2019, La Mirada, CA – Makita® U.S.A., Inc., manufacturer of high-quality professional power tools and accessories, announced the expansion of the MAX Efficiency accessory line with new 10” and 12” miter saw blades. The new MAX Efficiency blades are engineered to deliver optimal cutting performance in woodworking applications, and more cuts per charge when used with a cordless miter saw. The two new 10" 60T and 80T Carbide‑Tipped MAX Efficiency Miter Saw Blades are ideal for fine finish users looking for the most accurate and clean cuts in remodeling and trim work. The blades will cut through a variety of materials ranging from general lumber and plywood to hardwoods and melamine. When used with a cordless miter saw, the 10” 60T Carbide-Tipped MAX Efficiency Blade (B-66961) provides up to 100% faster cutting and up to 30% more cuts per charge compared to its micro-polished equivalent. The 10” 80T Carbide-Tipped MAX Efficiency Blades (B-66977) provides 65% faster cutting and 75% more cuts per charge. Makita launched three 12” blades with tooth counts of 60, 80, and 100. Also ideal for the fine finish user, these blades are designed for cutting base and crown molding. The 12" 60T Carbide‑Tipped MAX Efficiency Miter Saw Blade (B-66983), the 12" 80T Carbide‑Tipped MAX Efficiency Miter Saw Blade (B-66999), and the 12” 100T Carbide‑Tipped MAX Efficiency Miter Saw Blade (B-67000) provide 100% faster cutting and up to 30% more cuts per charge when used with a cordless miter saw. Each MAX Efficiency blade is expertly tensioned for precision and true cutting and manufactured from high quality hardened steel for added durability. Specially engineered ATAFR (Alternate Top Alternate Face w/ Raker) carbide tips assist to reduce the load put on the tool while cutting and provide smoother and faster cuts. The thin kerf carbide tip design provides greater efficiency with less drag on the motor and minimal material loss. The next generation of MAX Efficiency blades include 10" and 12" miter saw blades with various tooth counts. Thin kerf carbide-tipped design provides smoother cuts with less drag on the motor and minimal material loss.